Talent activation, as a practice, centers on an employer deliberately designing experiences throughout the employee lifecycle – from recruitment to retention – to unleash employees’ pre-existing strengths, energize performance and drive growth. An activated workforce is highly engaged, productive and loyal, qualities that can contribute to enhanced collaboration and encourage development as a competitive advantage. To view the press release and executive summary, please click on the links below. The annual Job Preparedness Indicator (JPI) survey conducted by the Career Advisory Board, established by DeVry University, identifies gaps between the skills and traits candidates have and the skills and traits employers seek to fill open positions. Gaps are measured by assessing skills that are most important and least common among entry-level, mid-level and senior-level job candidates. The Career Advisory Board shares the results of its survey on the technology skills gap. The research found deficits in both applied and hard tech skills among current employee circles and new applicants, and a general lack of preparedness for individuals entering the workforce with the right level of technical competency. The 2016 Job Preparedness Indicator survey continued to identify gaps between the skills and traits candidates have and the skills and traits employers seek to fill open positions. Gaps were measured by assessing skills that are most important but least common among entry-level, mid-level, and senior-level job candidates. This year’s research of nearly 500 US-based, senior-level hiring managers also explored how organizations are developing the necessary skills and competencies in their workforces, as well as their level of commitment to strategic talent development and management. The Career Advisory Board’s Most Desirable Jobs research was designed to discover the most preferred employment situations among American workers in order to provide hiring managers with intelligence that can help them recruit and retain talent in what is increasingly a job seekers’ market. The survey of 504 workers was conducted online within the United States by DeVry University on behalf of the Career Advisory Board in July 2016. The 2015 Job Preparedness Indicator is the fifth annual survey designed to identify gaps between the skills candidates say they have and the skills employers seek to fill available positions. This year’s findings indicate an overall emphasis on character over skill and hiring manager receptiveness to career changers – tempered by the preference for candidates who have directly related experience. Based on the findings, Career Advisory Board members provide actionable advice for how job seekers can shift their mindsets and improve their marketability. The Career Advisory Board’s Successful Job Seekers research was designed to uncover the actions and traits of individuals who were able to land new jobs quickly in a market where hiring managers are increasingly selective and many candidates go months or years without employment. The research was conducted online within the United States by DeVry University on behalf of the Career Advisory Board in March 2015. Survey respondents included 589 U.S. professionals who had accepted a new job in the last year, and who received an interview for that role within six months of being recruited or starting a new job search. The 2014 Job Preparedness Indicator is the fourth annual survey designed to identify gaps between the skills candidates say they have and the skills employers seek to fill available positions. This year’s findings indicate that few hiring managers are seeing the right combination of skills and traits to fill open positions. Job candidate differentiators include written communication and problem-solving skills. Based on the findings, Career Advisory Board members provide actionable advice for how job seekers can shift their mindsets and improve their marketability. To help professionals effectively transition to contract work, the Career Advisory Board, established by DeVry University, worked with MBO Partners, Inc., a provider of back office services for self-employed professionals, to conduct a new study, The Future of Work: Preparing for Independence, which examined the attributes and skills of those who are gainfully self-employed to help aspiring contractors get and stay ahead in this ever-changing work environment. To view the video and executive summary, please click on the links below. The 2013 Job Preparedness Indicator is the third annual survey designed to identify gaps between the skills candidates say they have and the skills employers seek to fill available positions. This year’s findings indicate a widening gap between America’s hiring managers and job seekers in terms of how each group views the skills employees need to thrive in the workforce, their outlook on the U.S. job market and the steps job seekers should take in order to gain employment. Based on the findings, Career Advisory Board members provide actionable advice for how job seekers can shift their mindsets and improve their marketability. To view the press release, full research report, infographic and executive summary, please click on the links below. The Career Advisory Board, established by DeVry University, published the research report, Career Services Use of Social Media Technologies, based on a survey conducted by the National Association of Colleges and Employers (NACE). The survey asked college career services professionals about their sentiments toward and their use of social media technologies in college recruiting and as part of career center operations. The NACE/Career Advisory Board survey found that career services professionals at colleges and universities nationwide have embraced the use of social media to communicate with students and employers, yet privacy concerns and limited training impede full use of the platforms. As a result, an opportunity to increase social media engagement amongst career services, students and employers emerged from the survey. To view the press release, executive summary or full research report, please click on the links below. The 2012 Job Preparedness Indicator is the second annual survey designed to identify gaps between the skills candidates say they have and the skills employers seek to fill available positions. Top U.S. employers ranked skills by their importance and how prevalent they are among candidates. Those skills that were ranked most important but least commonly seen among job seekers are considered the most highly valued traits. This year’s findings show that as Baby Boomers continue to retire from the U.S. workforce, their prospective replacements are falling short in their quest to fill critical positions. Based on the findings, Career Advisory Board members provide actionable advice for how job seekers can better articulate their experience to employers and bridge the skills gap. To view the press release and full research report, please click on the links below. The Career Advisory Board, established by DeVry University, published the research report, Effectively Counseling Graduating Students, based on a survey conducted by the National Association of Colleges and Employers (NACE). The survey of U.S. college career services directors covered concerns, issues and possible responses to the problem of effectively counseling graduating students for entrance into the job market. The NACE/Career Advisory Board survey found that students have a poor understanding of how to properly conduct a successful job search and also lack some of the tools and skills necessary to locate and acquire a job. As a result, an opportunity to increase student use of career center resources emerged from the survey. The second piece of research conducted by the Career Advisory Board, The Job Preparedness Indicator, assessed the value of key job skills. Top U.S. employers ranked skills by their importance and how prevalent they are among candidates. Those skills that were ranked most important but least commonly seen among job seekers are considered the most highly valued traits. In addition, the indicator also identified a disconnect between what job seekers perceive as necessary for landing a job in contrast to what hiring managers believe. Based on the findings, Career Advisory Board members provide actionable advice for how job seekers can close the skills gap and make themselves more marketable to employers. To view the press release, executive summary, full research report or infographic, please click on the links below. 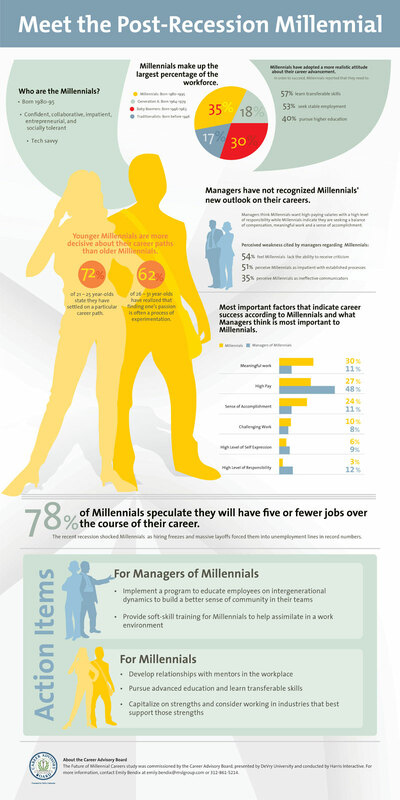 The Career Advisory Board released its first research study entitled The Future of Millennial Careers that measured the more realistic approach young professionals are taking with respect to their careers. Based on the findings, research co-authors Alexandra Levit and Dr. Sanja Licina provide actionable advice for those looking to advance their careers. For the full report and analysis, please click on the links below.